Arts and Cultural Alliance of Sarasota County » Selby Public Library Celebrates 20 Years! Selby Public Library Celebrates 20 Years! 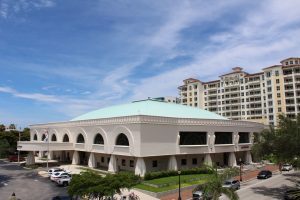 On Saturday, August 4th, the Selby Public Library will celebrate 20 years of serving the Sarasota community at the downtown, Five Points location. The library will host activities throughout the day including performances by Latin Rendezvous and Jazz with Sergie, 90s karaoke, an art and edible library contest, presentations by Mote Marine, a Creation Station open house, and a panel discussion with architects Aubry, Hoyt, and Hole, who were responsible for the Selby Library project. As we look back on the last twenty years, we recognize an even longer tradition of service, and a homecoming of sorts. The library began in Sarasota 111 years ago when John Hamilton Gillespie donated a room on the second floor of the “Stone Block Building” (where the Zenith building on Five Points is now) for use as a library, seeded with $40 donated by the Sarasota Town Improvement Society. The Women’s Club later played a crucial role, operating the library from 1913-1940 first in its own building and then in the former Sarasota High School on Main Street. The Chidsey Library was opened by the City in 1941 and operated until the County took over library services in the new Selby Library on the Bayfront in 1976. 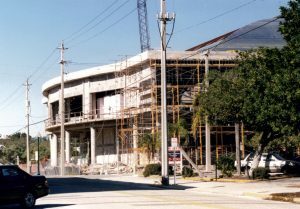 Demand for library services continued to grow and plans were made for a new, larger location for the Selby and Selby at Five Points opened on Aug. 1, 1998. 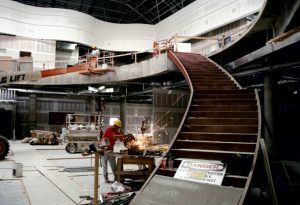 Since then, Sarasota has continued to grow just like the services provided at the library. The Selby Library has recently opened its Creation Station – a place where people can learn a variety of skills from sewing to 3D printing, Adobe Creative Suite software and digital music recording to virtual reality, and beading to bookmaking. As part of Sarasota County Library System, Selby also offers a wealth of online resources including ebooks, downloadable music, business and research databases, language learning tools, and much more. As we look forward to our next 20 years, we are confident that Selby and our community will continue to grow together. Please join us on August 4th for this grand celebration!